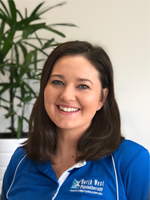 Dani has been working at North West Physio Keperra since we opened in 2015. She has a strong background in Pilates and now integrates this into her physiotherapy treatments, particularly for patients with neck pain, lower back pain, posture related issues or women who are pregnant or postpartum. Dani has developed a special interest in treating neck pain, headaches and women’s health conditions. Dani has undertaken post graduate training in the assessment and treatment of pelvic floor conditions such as stress or urge incontinence and a range of pre and post natal musculoskeletal conditions such as pubic symphysis pain, sacroiliac joint dysfunction and diastasis recti. Dani is also trained in dry needling and is available for small group and individual Pilates sessions for rehab and injury prevention.